Celtic fans received a boost ahead of tonight’s game against Bayern Munich at Celtic Park. The club announced that Kieran Tierney has signed a new 6 year deal for the club signalling to his admirers that he isn’t going anywhere anytime soon. Of course, we already knew that though didn’t we? It’s just that from time to time you have to silence the media who tend to fabricate matters for their own readership. Even with the continued press coverage linking him to the latest Premier League club, there wasn’t a chance KT would be signing for anyone else soon. He’s on course to be club captain as well as being the best footballing product to come out of Celtic (possibly even Scotland) since the 1980’s. Back to tonight though and Bayern Munich. 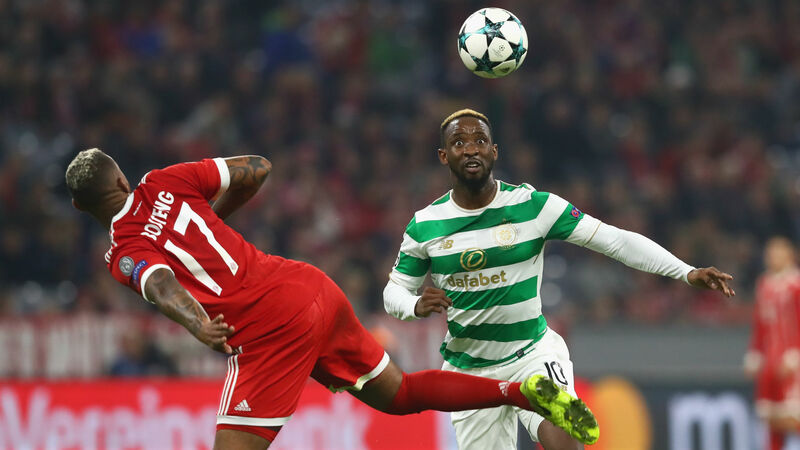 The German side beat Celtic convincingly at the Allianz Arena amid another night of starstruck Hoops players. Brendan Rodgers’ players need to believe in themselves. At home we can appear comfortable, but we can also be unconvincing at times, be it domestic or continental opponent. I was at the 5-0 game against Astana and Celtic Park was bouncing that night. As early as it was in the season, Celtic were expectedly not as sharp, but the performance they turned in that night was spectacular. Last Wednesday against Aberdeen the performance was on a different level as well. Celtic have dropped points this season and many thought (as I did) that Pittodrie might be one of those nights, but it wasn’t. Celtic put in the sort of display that demonstrated their prowess in Scottish football. With a few changes against Kilmarnock we didn’t get quite the same, but that wasn’t totally unexpected with one eye on tonight’s game. The emphasis on this match is huge. There is an obvious gap between Celtic and the top European clubs in terms of finances but there has been for a long time. On the playing field is a different matter. Yes they have more expensive players and more of them but that gap can still be closed. Celtic have shown in the past that they can inflict defeat on such opponents or at least slow them down to a draw. I also think some of Celtic’s results are down to what they did or didn’t do on the night. PSG wiped the floor with Celtic by three of the best forward in the world but did Celtic do everything and is this team still learning? Bayern demonstrated their squad strength by easing Celtic out in Germany over ninety minutes but I actually thought this was an improvement on the PSG match. Tonight Bayern will be without two key players in Robert Lewandowski and Thomas Muller not that it means the Celtic defence get a night off. They have Arjen Robben, Kingsley Coman and James Rodriguez to call upon. Celtic have to take this opportunity though and seize the moment. Just as they have in the past against teams like Porto, Juventus, Valencia, Manchester United, Shakhtar Donetsk, Benfica, AC Milan, Villarreal and Barcelona. They’ve all been beaten at Celtic Park in the last 20 years. They were all deemed to be better than us and overall probably so but you don’t write history without changing it. Let’s stand up and be counted tonight Bhoys. No matter the odds.